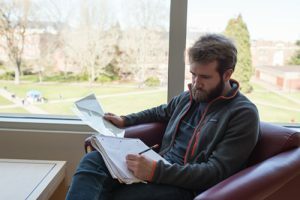 In his role as a student archivist in the Special Collections & Archives Research Center at Oregon State, senior Ethan Heusser digs through the millions of items in the extensive collection to find materials for patrons doing research. He has explored diverse artifacts, such as the papers of former Oregon State faculty member and poet, Roger Weaver, and Linus Pauling, a scientist and winner of two Nobel prizes, who studied at Oregon State as an undergraduate (when it was Oregon Agricultural College). For one project, Heusser studied the collection of Paul Persiani, a nuclear scientist who worked on the Strategic Arms Reduction Treaty between the United States and the Soviet Union. The papers consisted of letters Persiani sent home to his wife. “He offers a behind-the-curtain look: ‘I talked to the Russian ambassador today,’ or, ‘The Russian subdelegates don’t know if they’ll be able to find food at home.’ It shows the human interest side, humanizes people across the table, which today, more than ever, is important,” Heusser says. Heusser initially connected with the position, which is cofunded by SCARC and the Honors College, through his honors coursework. 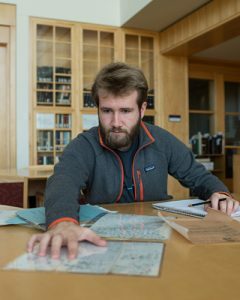 He met Anne Bahde, a librarian in SCARC, when she taught an honors course on the history of the book during his first year, and then again when she spoke to one of his other classes on the subject of digital humanities. Ultimately, he worked with Bahde as a digital humanities intern in SCARC. “The Honors College allowed me to build that relationship,” Heusser says.